In a world of rapid urbanization, we often assume there are no tribes left isolated without external contact on Earth. But the Sentinelese people who inhabit the tiny island of North Sentinel that is part of the Andaman group of islands in the Bay of Bengal are living proof to the contrary. They rejected all types of communication with outsiders repeatedly and they protect their land violently when anybody wants to establish contact. This violent response is part of a pattern of violence that has marked most attempts at contact by outsiders with this tribe over the centuries. 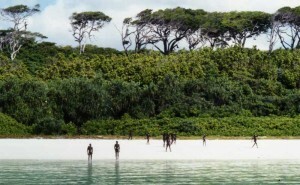 Believed to number anywhere from 50 to 400, the Sentinelese have lived in isolation on the island for 60,000 years, resisting attempts by authorities and anthropologists to study their culture and integrate them into the modern world. And when someone wanders to their island, like it happened for two fishermen on January 26, 2006, they relentlessly murder them. 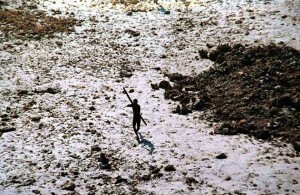 So protective are the Sentinelese of their territory that an Indian coastguard helicopter that attempted to retrieve the fishermen’s bodies (they had been tossed into shallow beach graves after their killing) was greeted by a volley of arrows from the tribesmen that prevented the craft from landing. But their hostile attitude towards strangers probably saved them from extinction over the centuries. While the current policy tries to preserve their culture, it was not always like that and other tribes from the Andaman Islands faced extinction. The Great Andamanese tribes, who numbered several thousand in the 18th century, were decimated by the Crown colonialists and currently less than 100 of them live. Their diet consists mainly of coconuts and fish that can be found in the shallow waters around their shores. Based on observational data, they are hunter-gatherers, as agriculture is not known to them. Their meat consists of turtles and small birds found on the North Sentinel Island. Initially thought to have been badly affected by the tsunami on Christmas 2004, it was soon revealed that the islanders had moved to higher ground before disaster struck – almost as if they knew the giant tidal wave was coming. Inhabitants of nearby islands were greatly affected by the tsunami but after several aerial reconnaissance missions conducted it is a fair assumption that there is no damage to the Sentinelese. If not for their metal-tipped arrows carved from hulls of wrecked ships, the Sentinelese would be described as Stone Age people. For instance, Sentinel canoes are constructed to fish in only shallow water. New Delhi has deliberately carried out little development in much of the tribal area, intending to preserve the culture of the tribes people and for fear that bacterial contamination may cause their extinction. As of now, the Sentinelese will be left to the isolation they had so vigorously defended over many centuries.